New non-ECDIS Electronic Charts Unit agreed. At the request of MSA member, the National Workboat Association, we have created a new Unit for smaller vessels which use non-ECDIS electronic charts. You can see the Unit here. In its response to the Government consultation on the funding of apprenticeships, the MSA has questioned the assumption that the best way to increase numbers is to put funding levers in the hands of employers. In our view the greatest barrier to increasing numbers of apprentices in training is employer perceptions of the bureaucracy and complexity involved in taking on apprentices. You can see the full response here. Where an industry has its own long-standing, employer-led, well-used, and regulator-approved industry programmes, Government should be very careful about applying its otherwise admirable principles in ways which might damage what already exists. The maritime sector has had to battle its way past Government constraints to achieve what we have: please do not add new obstacles which risk driving employers away from a system which is working. 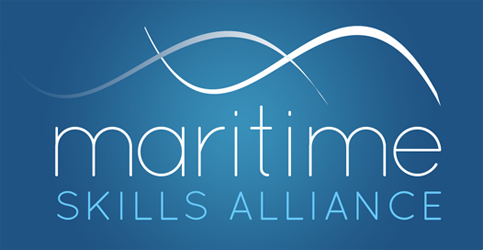 The Maritime Skills Alliance has won a prestigious international award for its work to create a suite of apprenticeships for the UK's maritime sector. Captain Nigel Palmer OBE, Chairman of the Alliance, collected the award from Seatrade at its 25th annual award dinner, celebrated in London's historic Guildhall on 10th May. Captain Palmer said afterwards: It's very encouraging to receive this recognition for the hard work which members of the Alliance have put in to create these apprenticeships. The wider maritime sector needs better opportunities for new entrants to follow top quality training programmes at all levels, just as officer trainees do, which combine real practical experience with study time ashore. These apprenticeships give people that chance, and a great foundation to a career in the maritime sector. We've also designed the apprenticeships so people can move across the sector as they develop their careers, because many of the core skills are the same whatever sector people are working in. The MSA has created five different apprenticeship routes, for able seafarers and tug ratings (both deck and engine room), deckhands in the fishing sector, those who work on inland waterways and port operations (stevedoring). All of them have been designed to fit with the other qualifications which the Alliance has developed, and all are recognised by the Government for apprenticeship funding. All bar the ports route are also recognised by the MCA as meeting their requirements. The MSA, in partnership with the Thames Training Alliance, submitted a bid to the UK Commission for Employment and Skills for support from its Employer Ownership of Skills fund. At its core is a proposal to create additional entry routes to the industry at pre-apprenticeship level, with associated training, and in particular a broad-based, sector-wide, 6-month Traineeship programme which can be tailored for different localities. We aim to get the jobs and training market for 16/17 year olds, which works very poorly today, working as well as it does for older recruits. Our proposal builds on growing interest in the maritime sector in re-creating high quality employment and training opportunities for ratings, and their equivalents in other parts of the sector. We expect to hear the results of the competition in July. Please contact us if you want to know more. These qualifications will offered in conjunction with existing shored based hospitality qualification to provide the additional skills and knowledge necessary to work effectively as a steward or stewardess on board a large yacht, ferry or cruise ship. On 15 October the MSA organised a very successful Seminar on this subject, which was held at Trinity House, London. Attended by over 90 delegates, it provided an opportunity to showcase the current range of maritime related occupations and apprenticeships. Speakers included Ian McNaught, (Deputy Master Trinity House), Capt. Nigel Palmer (Chairman, MSA), Philip Wells (Secretary, MSA), Roger Towner, (Head of Seafarer Services MCA) and John Chudley, (Divisional Director: Southern, National Apprenticeship Service). A more detailed report of the proceedings can be found on the publications/downloads page. (October 2012). After considerable discussion and negotiation with the National Apprenticeship Service it has been possible to create two advanced level pathways for Merchant Navy (deck and (engineering). It is intended that these should form the first year of the approved alternative route to becoming a junior Merchant Navy Officer. Progression in most cases would be to an HNC/D, the remaining part of the approved programme. At present these pathways are only available to employed apprentices, but it is intended to seek Government approval for the use of alternative completion conditions, which would permit sponsorship, the usual method of recruitment to the programme. The detailed content of these pathways is contained within the Maritime Occupations Framework (available as a download) It is also intended to create two further pathways covering other seafaring occupations that require more restricted forms of international certification. (October 2012). It is anticipated that a further pathway for workboats will be added over the next 12 months. The qualifications which form the basis of the intermediate apprenticeship are at Level 2. (October 2012). The quinquennial review of the Maritime Pilots NOS has been completed and is available as a download from the following website: www.portskillsandsafety.co.uk. The NOS relating to Port Operations, Supervision of Port Operations and Vessel Traffic Services, are now being reviewed and consultation is in progress. It is expected that the work will be completed by February 2013 (October 2012). The qualifications arrangements are different in Scotland and for an existing Maritime Studies Qualification to be recognised there it requires approval and accreditation by the Scottish Qualifications Authority. There are now two of these, the Certificate in Maritime Studies: Able seafarer/tug rating (deck) and the Diploma in Maritime Studies: Sea Fishing. Others will follow during the next 6 months. (October 2012). Work on developing a Maritime Modern Apprenticeship Framework for use in Scotland in now well underway. The first two pathways for able seafarer/tug rating (deck) and Sea Fishing are now in place, with others to follow, when demand has been established. (October 2012). The quinquennial review of the major suite of marine NOS has been completed and some amendments made to reflect the latest regulatory requirements. Several other related NOS have also been incorporated to create a single suite renamed ‘Maritime NOS’ They are now available as a download from the publications page and are being used to form the basis of maritime related qualifications. (October 2012). Details of the qualifications and the units that make them up can be downloaded from the publications page. The relevant learning programmes are now available through approved providers. Work is continuing on the development of level 3 and 4 qualifications, with the aim of providing an all-encompassing suite to meet the needs of the whole sector by September 2012. (February 2012). The MSA has been working with Open Awards to develop entry Level 3 and Level 1 Maritime Skills Awards and Certificates for use in schools, youth organisations and the ‘not in employment, education and training’ group. These have now been placed on the Qualifications and Credit Framework for England, Wales and Northern Ireland and further details of the content may be downloaded from the publications page. Those who complete the qualification will be well placed to progress to a Maritime Intermediate apprenticeship (February 2012).